While we have always keep "lists" of stations that are committed to offering a non-ethanol fuel choice at their stations, the composition of fuel, (with or without alcohol), changes so frequently that we have never posted this information online. As of this date, there are no laws to assure future availability of ethanol free fuels. Stations that prefer this fuel type often have no choice other than to switch to E10 when their disributor decides to only offer gas with up to 10% ethanol blended-in (E10). Most newer automobiles can switch to E10 gas type with no problems other than a decrease in fuel efficiency (mpg). But for many other gas-powered engine types NON-ETHANOL fuel is required and/or the best fuel choice. Ethanol is now added to all conventional gasoline types primarily to meet requirements stated in federal legislation over past 5-10 years including the Renewable Fuel Standards (RFS), Energy Independence and Security Act (EISA) and Clean Air Act -More information can be found on our "ethanol history" and "politics/laws" pages. In high pollution areas (included under the Clean Air Act for required oxygenation of fuel), when MTBE was banned most replaced it with ethanol alcohol. Are there any benefits to adding ethanol to gas? Whether or not ethanol actually decreases pollution or our dependency on foreign oil is a highly debatable topic due to the amount of fossil fuels (oil) necessary to make (distill) and transport ethanol. Government ethanol tax subsidies, credits and grants in combination with the political power and desire for higher profits for ethanol producers and distributors reinforce that ethanol may be more hype (scam) than beneficial. Ethanol is a very effective antifreeze and fuel system cleaner which replaces need for additional gas additives - But few realize this and often still purchase unnecessary and contraindicated gas additives in hopes of curing the problems ethanol will cause, further increasing their risk for engine damage! Have you ever seen a warning on an alcohol-based gas additive that states "Do Not Use With E10 gasoline"...Of course not! One more example of how nobody is looking out for the public regarding use of ethanol-blends of fuel. We believe the rapid transition to E10 blends over past couple of years is primarily due to selfish profit motives. There is no objective and factual evidence that ethanol decreases oil consumption or pollution. Based on the greater than 10% reduction in mpg so many engines experience from E10 fuel, we believe E10 actually increases oil consumption and oil & gas industry profits. We strongly advise you to check gas for ethanol presence and percent to protect your engines since over-blending (above 10% legal maximum) and mis-labeling (E10 stickers on pump) is very common. Last update 4/18/2014-Page created 2010: www.fueltestkit.com and www.fuel-testers.com - Fuel-Testers Company Resources to Locate Ethanol-Free Gasoline. Less than 5% of all public stations now offer alcohol-free gasoline! due to greed and profit motives from the ethanol industry, promoted by the United States Government. Today, over 95% of all gas sold is E10 type (10% ethanol), due to federally mandated rising volume quotas for ethanol. With the false promises that ethanol would decrease our dependence on foreign imports, decrease pollution and create domestic jobs, engines owners have lost their right to purchase gas withOUT alcohol. What most refer to as conventional fuel and "regular gas" has become E10 type. U.S. Senate Committee on EPW reports: "Lack of access to ethanol free gasoline has been a primary concern across the nation: Ethanol decreases fuel economy and in some instances can cause fuel damage..."
Important: Read comments/tips below, especially #5 +#6 which states, ethanol-free station "internet lists are often out-dated and inaccurate..." and station owners rarely confirm or test gas to assure fuel delivered is actually without ethanol. 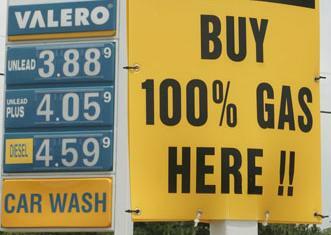 There are 168,000 retail locations in the U.S. that sell fuel to the public. (Source, NPN: National Petroleum News + API: American Petroluem Institute). Quik-Check solution (QCS) is included with complete Alcohol Fuel Test Kit (AFTK) or can be purchased separately. Quik-Check instantly reveals alcohol/water in fuel. 1. Gas composition (with or without ethanol) changes quickly, sometimes as often as every few days or daily. 2. Availability to non-ethanol gas is dependent on whether or not it is available from lthe ocal fuel distributors and refineries. Often a station owner has no other choice than to sell E10 type. 3. Calling your local fuel distributors (oil and gas companies) is often the quickest way to find an ethanol-free pump. 4. Station E10 pump labels are very unreliable - E10 sticker that states "May contain up to 10% ethanol" is meaningless - Gas may NOT contain ethanol, gas may contain above 10% (illegal overblending), gas may contain 5, 8, 10, 12 or just about any percent -Fuel composition changes with each (daily) delivery. 10. The only 100% accurate method to confirm gas does not contain ethanol is to test a sample at the pump. Additional contacts are listed (see bottom of petition form) to voice your opinion on ethanol in gas. Consumers are rapidly losing their choice to ethanol-free fuel at neighborhood stations. The widespread transition to E10 as a conventional fuel type in recent years has left many without the appropriate fuel type (without alcohol) recommended by their engine's manufacturer. - Those who purchased gas with over 10% ethanol or used gasahol in an engine type not designed to tolerate alcohol, are well aware of the damage it can cause. No laws exist that require gas stations to monitor the amount of ethanol added! Most state inspectors do not even check ethanol content at the yearly station certification. - Many fuel distributors no longer offer ethanol-free fuel "pure-gas" and when they do they usually charge 20 to 30 cents more per gallon. Ethanol blending tax credits (up to 53 cents/gallon in some states) offer a profit motive for over-blending and sale of E10 & E15. In certain locations illegal over-blending is rampant -E.G. 10% ethanol is blended in at the terminal and then the fuel distributor adds another 10% ethanol (result= E20 or higher) to profit from government tax credits. - Low level ethanol blends are unstable due to rapid water contamination. We strongly urge you to test percent ethanol of gasoline before purchase. Always report contaminated gas to gas station owner (corporate office) and the government office in your state that oversees gas quality (often the Dept. of Agriculture Division of Weights & Measures oversees gas quality). - Several states do not require pump labeling when ethanol is added. View engine manufacturer ethanol recommendations and warnings. This resource page was added to our Fuel-Testers company website(s) in November 2010 to assist our customers (and the public) to locate the dwindling number of gas pumps that still offer gasoline without ethanol. 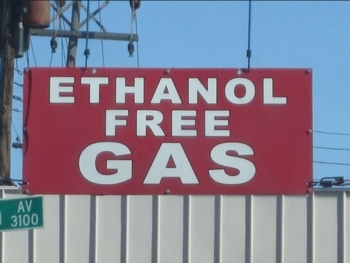 Please contact us to add your list of ethanol-free gas stations to this page. (631) 532-9447. Check Ethanol % in Gas. Scroll down page for more information. #2. BuyRealGas.com is a website that lists state-by-state ethanol-free "real gas" stations in the U.S. This site has maps with interactive click-on icons that include station location and details. Similar to pure-gas, public is responsible to add and update station listings. 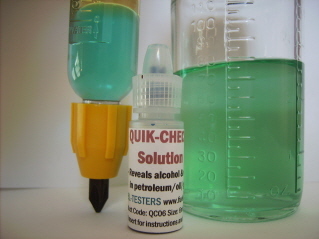 Quik-Check Solution™ instantly reveals alcohol/water in fuel. Cost pennies to test. 15ml Dropper bottle: 450 drops/tests=$14.95 ea. #3. GasBuddy.com forums for your state or area: GasBuddy and GasPrices have forum threads posted by the public that list stations selling ethanol-free fuel. Forums are arranged by specific areas and towns -E.G. Areas: Albany, Atlanta, Grand Rapids, Louisville, Detroit, Memphis, Wichita, etc. Examples: http://www.tennesseegasprices.com/ -OR- http://gasbuddy.com/Gas_Prices/Tennessee/index.aspx -OR By County - http://gasbuddy.com/Gas_Prices/Tennessee/Anderson/index.aspx - OR By Town...Etc. Also view forums under category topic "All Things Ethanol". #4. Oregon.gov - Oregon State Marine Board: A reliable list of gas/oil retailers and distributors that offer ethanol-free fuel. A very educational government website that includes an easily printable list with both station/distributor name, county location and contact information. List partiularly useful for boaters in Oregon, includes many marinas. Visit: Main ethanol page: Now includes an interactive map for finding 91 premium octane ethanol free gasoline. http://www.oregon.gov/OSMB/news/docs/EthanolList.pdf (Click on link for ethanol-free gas list). Check back often - More resources will be added. ALWAYS test fuel to confirm alcohol-free. Who wants or needs E0 pure-gas? View FUEL CHOICE petition responses. Quik-Check Solution instantly confirms no alcohol and/or Alcohol Fuel Test Kit reveals percent ethanol. Individual fuel-testers - Re-usable-Will last a lifetime. #1. pure-gas.org is a site designed in 2009 by a private citizen who is "dedicated to one, simple task: to list the gas stations in the U.S. and Canada that serve ethanol-free gasoline". Although the owner of this site suggests testing gas at the pump to confirm fuel is alcohol-free, there is no requirement to validate fuel is actually without ethanol before posting on site, and updates not required if/when a station resumes selling only E10 type. A comprehensive easy-to-use and attractive site which devotes a separate page for each U.S. state and Canada. Buy Ethanol-Free Gas to Protect Your Engines and Save Money. Consumers must reclaim their right to purchase gas that does not contain alcohol, when pure-gas is manufacturer recommended, and/or the engine owners' preferred fuel type.